2014 Wisconsin Wolf Hunt Ends, Sort Of…. 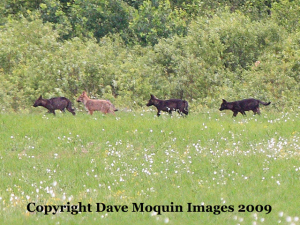 Wolves at Crex Meadows, 2009. Photo on WDNR website. It was a little like coming home. The two story farm houses, the flat horizon, and the fields of corn stubble covered by snow looked much like Iowa, where I grew up. But I was keenly aware of one major difference between the two states. Wisconsin has wolves. Iowa doesn’t, at least not yet. I spent last weekend in Western Wisconsin researching a story for Earth Island Journal. I met with Rachel Tilseth, wolf advocate and author of the informative blog Wolves of Douglas County, as well as members of the Great Lakes Wolf Patrol, a grassroots organization spearheaded by Rod Coronado (formerly with Sea Shepard). The mission of Wolf Patrol, whether in the Great Lakes or Montana, is to document the wolf hunt, educate the public, observe for poachers, and make sure hunts end when they are supposed to. Wolf Killed WDNR Violation Hotline Followup: Leads to questions of ethics.